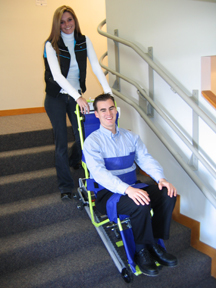 The Evacu-Trac evacuation chair should be kept in any multi-storey building where disabled people live, work, or visit. It provides a fast safe and reliable means of evacuation. This easy to use evacuation device is equipped with many safety features and most importantly, provides people with limited mobility an equal opportunity for escape in an emergency.